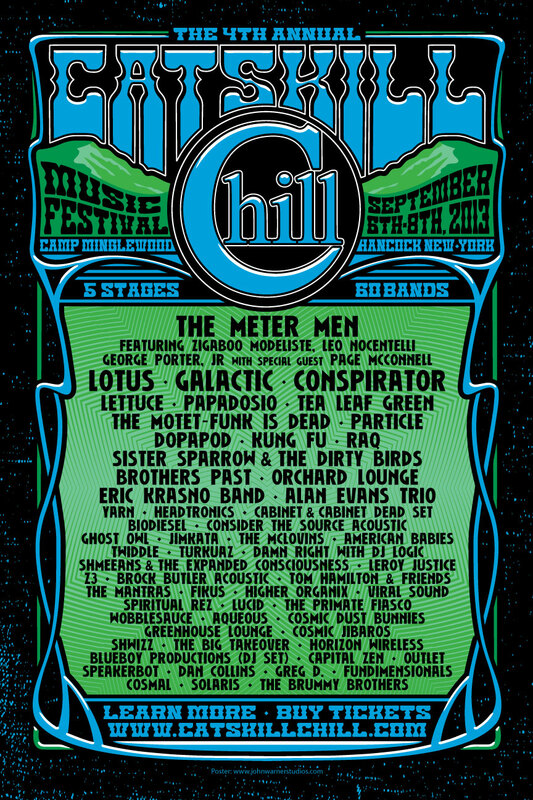 Catskill Chill Music Festival has announced the lineup for the fourth annual Chill at Camp Minglewood in Hancock, New York. Taking place September 6th – 8th, the 2013 event will offer more music than ever before with 60 acts performing live on five stages during the 3-day camping festival. Featured artists include: The Meter Men featuring Zigaboo Modeliste, Leo Nocentelli and George Porter, Jr. with special guest Page McConnell; Lotus; Galactic; Conspirator; Lettuce; Papadosio; Tea Leaf Green; The Motet - Funk is Dead; Particle, Dopapod; Kung Fu; Sister Sparrow & the Dirty Birds and many more. After selling out in 2012, organizers have announced that in an effort to preserve the intimate feel and family vibe of the Chill, capacity will remain the same in 2013. Earlier this year, onsite cabins sold out in 90 minutes and with this year’s stacked line-up, tickets are expected to disappear quickly. A limited number of Early Bird tickets are available now for $135 but prices will go up soon, so grab yours now at www.catskillchillcom. Nestled in the Catskill Mountains, where the beauty of nature synchronizes with the euphoric sounds of live music, this intimate lakeside event is one of the most anticipated festivals of the year and a perfect close to festival season. New additions to this year’s Chill include a bigger and better Acoustic Junction stage, a new campsite DJ stage, and an extended schedule at the infamous Club Chill. The festival still features free parking, free camping, on-site cabin rentals, 3 covered main stages and 2 outdoor stages. Festivalgoers can also enjoy yoga, drum circles, live art, on-stage open mic sessions and a communal bonfire each night.